The Early Opera Company was founded by Christian Curnyn in 1994 and has steadily established itself as an important interpreter of Handel's Opera ever since and their productions are noted for their visual and musical style melded by Curnyn's keen musicality. This is their third album with the Chandos label and the first to step outside Handel's repertoire. This work has an interesting history. It was written in response to an advert placed in the London Gazette in 1700 by a group of noblemen who wished to advance the cause of English opera which they saw as being in decline flowing the death of (Henry) Purcell. The result was four settings of The Judgement of Paris by Daniel Purcell, John Weldon, Gottfried Finger and John Eccles to a libretto by the leading playwright William Congreve. On this occasion the first prize was won by Weldon but, as Lindsay Kemp explains in his sleeve-notes, the 1989 Proms saw Anthony Rooley present these operas to an audience vote in which Eccles was at last triumphant. 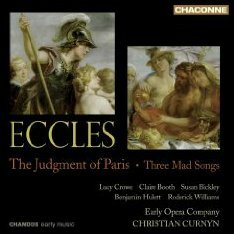 This new release from Curnyn is the first complete recording of Eccles' opera and has been cast with fine soloists. The first of these is Roderick Williams (Mercury) who, after the stylishly played symphony, opens the opera with his commanding baritone and explains the task that is to be set before Paris. Benjamin Hulett (Paris) is delightful as the young and naïve shepherd gawping in delight at a trio of goddesses yet humbled by the difficulty of deciding who is the most beautiful. His light tone is backed up with a wonderful presence that really draws in the listener. The goddesses themselves are, well, goddesses – vocally speaking – and each of them has a pair of contrasting arias in which to put forward their case in an attempt to win the shepherd's vote. Juno (goddess of marriage) offers Paris the opportunity to ditch his crook and become the ruler of an Empire. Susan Bickley is arrestingly brilliant in this role and her aria 'Let Ambition fire thy mind' is one of the most exciting due to a combination of her singing and the tight orchestral playing. Pallas Athene (goddess of war) offers victory and fame through future combats. Claire Booth's 'Hark hark' aria with four trumpets all sounding together for the first time is dazzling and vital. But then Venus (goddess of love) promises him the love of a woman such as Helen [of Sparta], and Paris, no doubt guided by his hormones, chooses Venus as the prizewinner. Lucy Crowe, accompanied by her soft flute, is feminine and beguiling – no wonder she wins the Golden Apple. This Masque/Opera may only be 50 minutes long but it's exciting and well formed; it definitely deserves to be heard much more often than it is particularly as it is such an effective vehicle for the female soloists. And Curnyn is aware of just how versatile his singers are because to end the disc they each sing one of Eccles Mad Songs (from the 1704 collection) which are little gems in themselves. I was particularly impressed at the broad palette of colours they use and their dramatic timing in what is, quite literally, mad music. Particular mention should be made of the quality of the recording itself. Curnyn's orchestra is sprightly and all of their meticulous detail is captured without any suspicion of over-mixing or excessive editing. The result is a very stylish performance that deserves wide recognition.